Saddam International Airport is located approximately 16 kilometers West of Baghdad. The airfield is a joint civil-military airport, with a civil international terminal on one side and a smaller military ramp on the other. The airport is served by a Class I runway 13,000 feet long and a second runway on the military side of the airfield measuring 8,800 feet. According to the "Gulf War Air Power Survey, there were 8 hardened aircraft shelters at Saddam IAP of 1991. An Iraqi Airways Boeing 737 made a test flight from Amman to Baghdad 24 August 2004. The company has $300 million to lease or buy aircraft from Airbus and Boeing. Ticket prices of Iraqi Airways appeared to be nearly 20 per cent higher than normal, but it could be due to high war insurance. Round-trip airfare from Amman to Baghdad is US$750. There is credible information that terrorists are targeting civil aviation. Civilian and military aircraft arriving in and departing from Baghdad International Airport have been subjected to small arms and missiles. Civilian aircraft do not generally possess systems, such as those found on military aircraft, capable of defeating man-portable, surface-to-air missiles (MANPADS). Anyone choosing to utilize civilian aircraft to enter or depart Iraq should be aware of this potential threat, as well as the extremely high risk to road transportation described below. Official U.S. Government (USG) personnel are strongly encouraged to use U.S. military or other USG aircraft when entering and departing Iraq due to concerns about security of civilian aircraft servicing Iraq. Currently, USG personnel are only authorized to travel commercially on Royal Jordanian Airlines. A British C-130J aircraft launched a display of flare countermeasures just prior to being the first coalition aircraft to land on the newly reopened military runway at Baghdad International Airport, July 1, 2003. The military runway was bombed by coalition aircraft and had been closed since the beginning of the war. Thanks to the help of the 1st Expeditionary Red Horse Group and the 447th Expeditionary Civil Engineering Squadron, the runway has been repaired and is once again operational. The British aircraft was delivering cargo and passengers to Baghdad in support of Operation Iraqi Freedom. The Baghdad International Airport (formerly Saddam International Airport) has been refurbished and repaired as part of a $17.5 million contract from USAID to SkyLink to rebuild Iraqi airports in Baghdad, Basr and Mosul. The French-designed airport Baghdad airport was severely damaged during the war, although it had also fallen into disrepair as a result of UN-imposed sanctions.. The duty free shop is open and awaiting passengers. Currently only military, UN and one or two 15-seat propeller planes which carry aid workers land at the airport. The airport has the capacity to handle 7.5 million passengers a year. The new Iraqi Army of 40,000 persons require basing facilities at 18 locations. 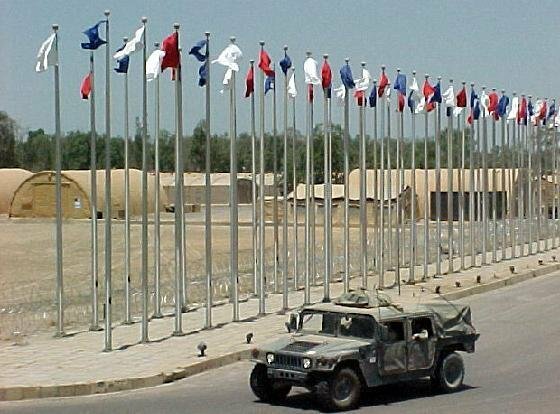 Prospective Military Bases to re-construct include Baghdad International Airport. In August 2003, the 439th Engineer Battalion restored electrical instruments and sewer lines, water lines, irrigation lines, and cleaned up many bombs that were found in the area. The Al Jaderia Irrigation pumping station which provides a constant supply of water to the agricultural communities of Southwestern Baghdad was restarted 05 August 2003. The station provides irrigation water needed by local farmers and communities to reservoirs located near the Baghdad International Airport. The work was done with Iraqi materials and by Iraqi engineers and laborers. Soldiers from the 1st Armored Division's 1st Squadron, 1st Cavalry Regiment and 16th Engineer Battalion, using funds provided by the division, worked with the U.S. Army Corps of Engineers and the Al Macaa General Contracting company to repair the station's pumps, electrical equipment, sewer, water and irrigation lines. The main purpose of the station is to feed all major water reservoirs surrounding BIAP through three water mains. Two of these water mains are badly damaged. Many were damaged by local residents tapping into the pipes attempting to get water. Like a snake moving slowly through the brush, a familiar scent weaves its way through a crowd of hungry soldiers waiting patiently outside the new Army and Air Force Exchange Service (AAFES) Pizza Hut and Burger King in Baghdad, teasing them as they wait patiently since its first full day of operation on 10 June 2003. 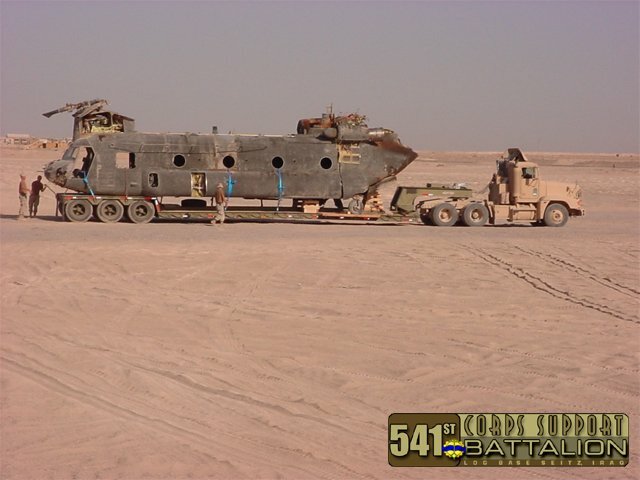 The sheet metal, Kitchen equipment and wooden and steel beams needed to build a Burger King in the desert made their way to Baghdad via convoy in May 2003. The Burger King was open for business before there were dinning facilities here for the troops. As their noses take in the aroma created by the flame-broiled Whopper sandwiches cooking inside, their dirt-caked faces suddenly light up with enthusiastic smiles that silently proclaim, "we're home!" Army officials would be the first to tell you that nothing helps keep the morale of its soldiers at a peak level like the reminder of things back home. And few would disagree that having a new Burger King restaurant smack dab in the middle of Baghdad is a major touch of home. The food outlet, located at the former Saddam International Airport (or BIAP), is testimony to AAFES' "We go where you go" commitment to serve the troops wherever and whenever possible. On an average day, the Burger King broilers turn out over 6,500 Whopper sandwiches to homesick troops looking for a familiar taste of home. Although this Burger King is considered an AAFES restaurant, it's staffed by a franchisee from Kuwait. When the sun gets too much, soldiers can also stop of to buy cool shades at the Oakly shop. As of late November 2003 plans to transition commercial side of BIAP to civilian control were underway. Approximately 60 non-military flights arrived / departed each day. According to a June 17, 2004, story in USA Today, the United States was handing back control of the facility's 35 acres of land as well as its 40 service buildings, in preparation for the June 30, 2004 transfer of sovereignty. The plan, reportedly called for the civilian part of the airport to be run by Iraqis in mid-July, with the military part of the airport being returned to Iraqis in mid-August. 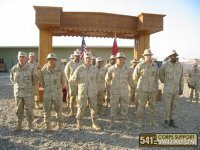 Accorcing to a September 7, 2004 Army News Story, control of Baghdad IAP was returned to the government of Iraq from coalition forces on August 25. The process, begun on June 15, 2004, with a turn-over of the air traffic control tower, and checkpoints was concluded with a final exchange of the main gate. Prior to the exchange, the airport was controlled completely by the Coalition and allowed very limited commercial traffic with the only flights aloowed at BIAP being military and charter. Only small portions of the airport are reportedly still being occupied by coalition forces under an agreement reached with the Iraqi Ministry of Transportation to allow military aircraft being brought in. 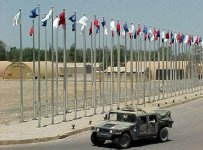 Coalition forces operate security perimeter around the airport while the Iraqi government hired a private security firm to put checkpoints and security on the airport. That company, Global Security, is an Iraqi-hired company that does not train with the Coalition. Baghdad's central booking is Camp Cropper, a holding compound for detainees. 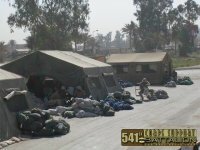 The 115th MP Battalion was assigned to the Camp Cropper [High Value Detention (HVD) Site], BIAP, Iraq. The 744th MP Battalion operated the HVD Detention Facility at Camp Cropper and met mission requirements with little to no guidance from the 800th MP Brigade. 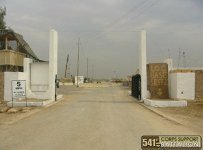 On 09 June 2003 there was a riot and shootings of five detainees at Camp Cropper, operated by the 115th MP Battalion) Several detainees allegedly rioted after a detainee was subdued by MPs of the 115th MP Battalion after striking a guard in compound B of Camp Cropper. A 15-6 investigation by 1LT Magowan (115th MP Battalion, Platoon Leader) concluded that a detainee had acted up and hit an MP. After being subdued, one of the MPs took off his DCU top and flexed his muscles to the detainees, which further escalated the riot. The MPs were overwhelmed and the guards fired lethal rounds to protect the life of the compound MPs, whereby 5 detainees were wounded. Contributing factors were poor communications, no clear chain of command, facility-obstructed views of posted guards, the QRF did not have non-lethal equipment, and the SOP was inadequate and outdated. As of August 2005 a new compound was being constructed at Cropper. It will consist of four pads, each approximately 400 by 400 feet and will increase detainee capacity from 163 to 2,000. 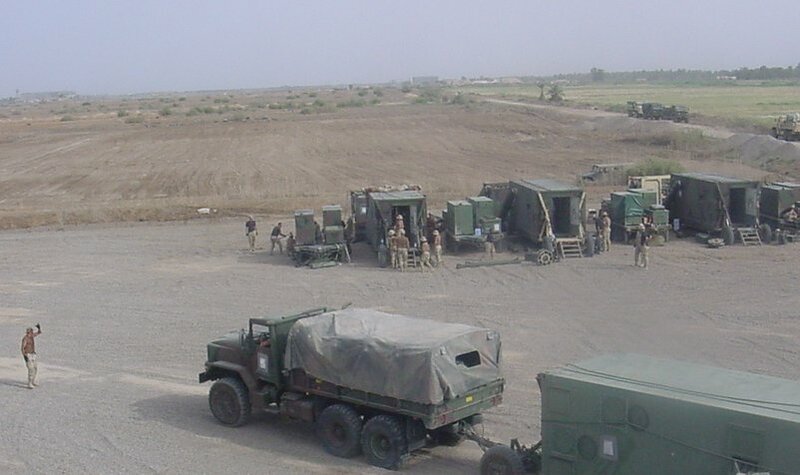 The site was a landfill prior to Operation Iraqi Freedom III. Numerous units helped out with the clearing operation by knocking down and leveling berms and clearing the site. Elements from the 365th, the 92nd Engineering Combat Battalion (Heavy) and an element from the Kansas Army National Guard moved earth, trash and dismantled a very tall water tower. Over 25 bulldozers, excavators and other engineer vehicles were used to clear the area and level the construction site. Camp Sather is a temporary base at Baghdad International Airport. The Air Force's 132-tent Camp Sather lies next to the airport's flight line but inside a larger area that's controlled by the Army. 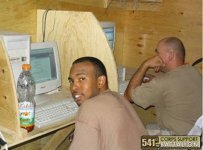 As of August 2003, about 1,300 airmen live and work at Camp Sather, headquarters of the 447th Expeditionary Group. The camp -- named for Air Force Staff Sgt. Scott Sather, a combat air controller killed in combat April 8 -- is on the west side of Baghdad International Airport. The camp is unique to the Air Force. No planes are based here; those that do arrive are serviced, loaded and sent back out. 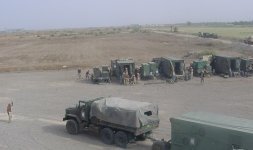 Most of the Iraqi Armed Forces personnel and equipment have to transit through Camp Sather on their way to other destinations in the region. 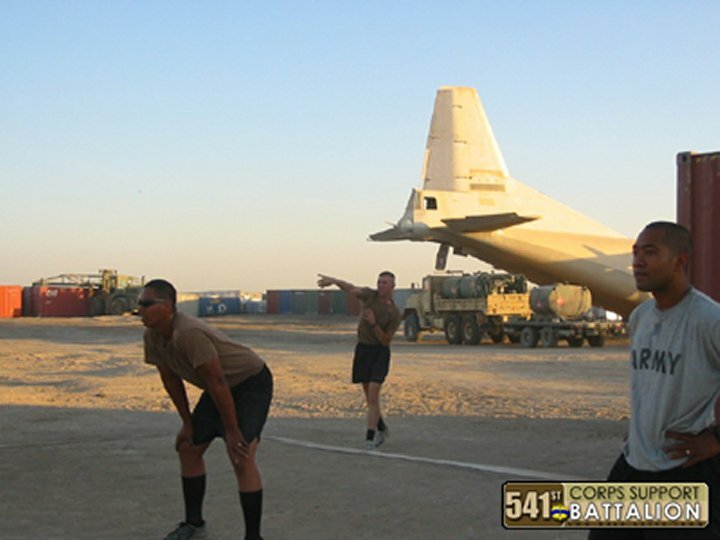 The 447th AEG provides security screening, vehicle transport, and passenger services for them. In addition, squadrons here have assisted with force protection, entry control, communications, fuel, medical and supply needs of New Al-Muthana AB. But there's more to Sather than pallets, people and prisoner movement. Almost daily, there is a VIP on the doorstep. The guest list includes prime ministers, politicians, the secretary of defense, attorney general and secretary of state. Most VIPs pass through the group's headquarters building. Dubbed the "Glass House" for its ornate rooftop mosaics of mirrors, the building formerly served as Saddam Hussein's personal military terminal. US Air Force Staff Sgt. Kristina Baker and her dog Rex are members of the first Air Force canine teams deployed to Camp Sather, Baghdad International Airport, Iraq. 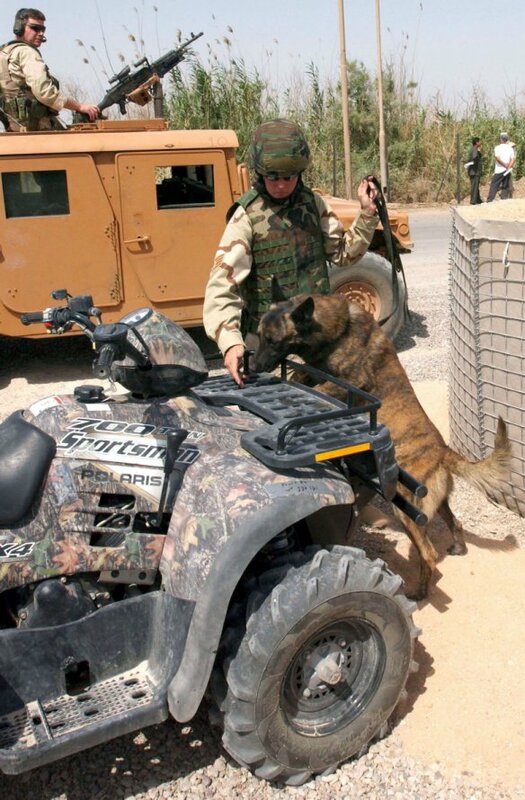 Rex searches a car carrying equipment to set up a coffee shop at the camp. Staff Sgt. 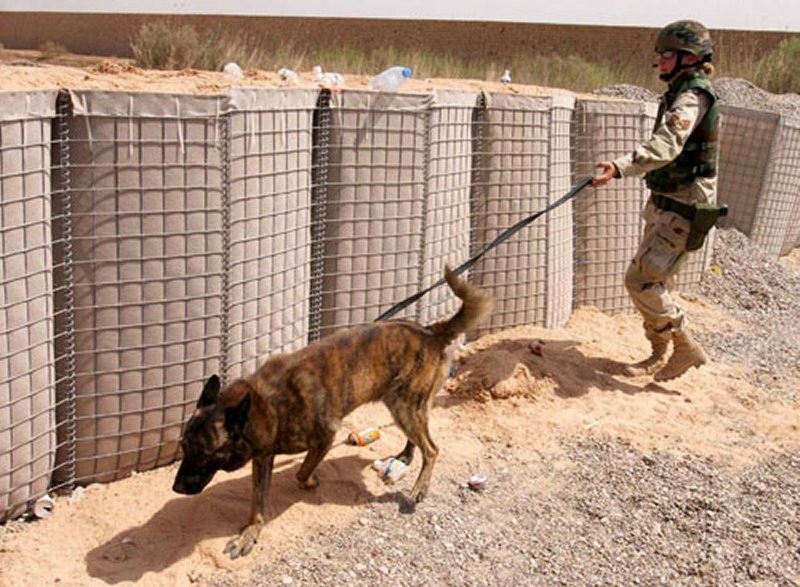 Baker and her dog are deployed from Charleston Air Force Base, SC in support of Operation Iraqi Freedom. 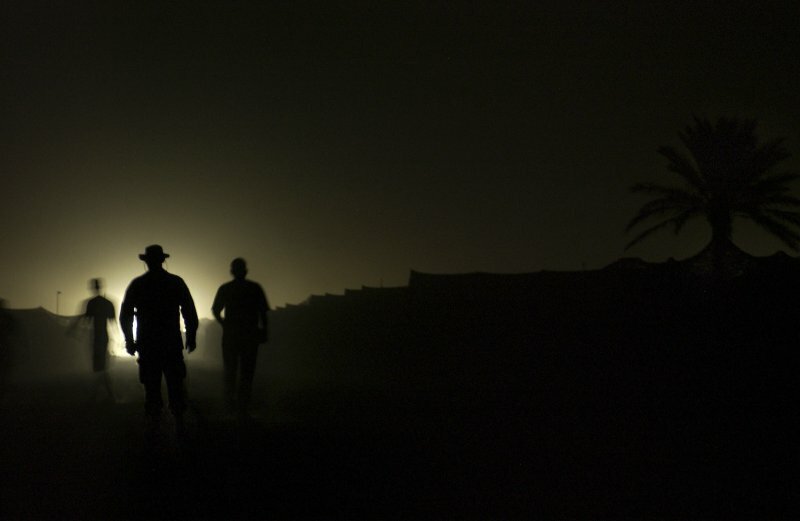 Airmen from the 447th Air Expeditionary Group walk among tents during blackout conditions. 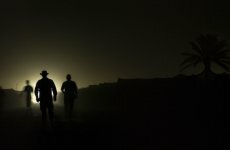 After a bombing in nearby Baghdad, the camp located at Baghdad International Airport was bathed in darkness as a force protection measure. Unlike Army camps in the area, all tents and buildings that airmen live or work in at Camp Sather are air-conditioned. Camp Sather also has telephones for stateside calls home and Internet access is readily available and dependable, unlike the Army, where soldiers spend hours waiting for brief calls home or to get online for a few short minutes. While Army soldiers often travel about in open Humvees, airmen drive air-conditioned SUVs and four-wheel-drive pickups that were shipped here from other Persian Gulf bases. The Air Force also provides airmen a laundry with washers and dryers to clean their uniforms. The Army uses oil pans and buckets. Other amenities at Camp Sather include an air-conditioned chow hall with sinks at the entrance for airmen to wash their hands. 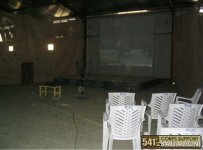 The popcorn machine from Prince Sultan Air Base in Saudi Arabia is installed in Camp Sather's movie theater. Airmen eat MRE's for the most part (Chow hall is open for breakfast and dinner but with duty schedules it is difficult to trade sleep for food sometimes), and try to stay cool. Unlike most of their Army counterparts, Air Force personnel at Camp Sather are strictly prohibited from leaving the airport. The closest they have gotten to seeing Baghdad is an occasional trip to the Army post on the other side of the airport. The sound of occasional gunfire can be heard in the distance, but the airport's secured perimeter of several miles makes the threat of harm very small. 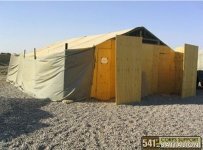 Civil engineers have replaced over 120 tents at Camp Sather with more modern "Alaska" style tents in a $4 million project. These Alaska tents stay cooler and offer more space. As of the Fall of 2005 there were about 750 Airmen here. The squadron and staging facility combined forces to make up the largest Air Force medical squadron in Iraq. Formally known as the Mobile Air Staging Facility, the unit can hold 100 mass casualty victims up to 12 hours. Routinely, it houses 50 beds with surge, which means it can handle well over 50 patients at a time should a crisis occur. Doctors, surgeons, nurse anesthetists, nurses and medical technicians work like a well-oiled machine, 24 hours a day, seven days a week. 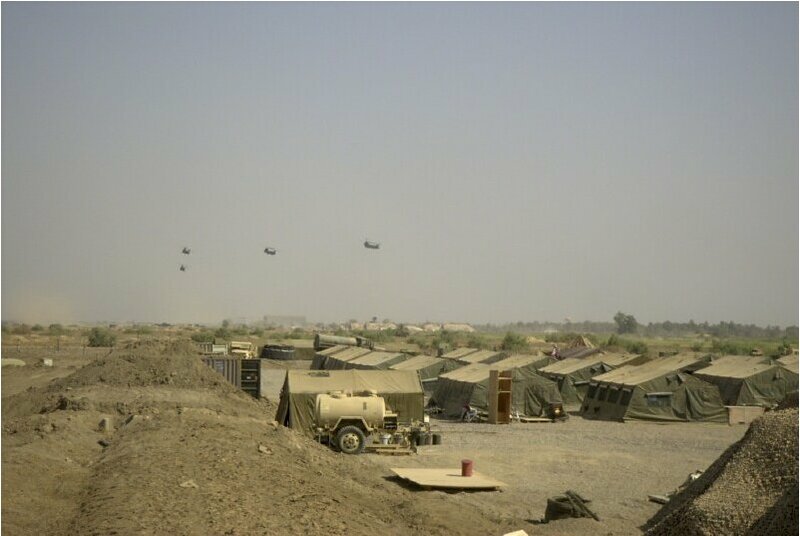 Camp Griffin is on the north side of the the Baghdad International Airport Compound. 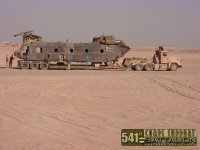 The 728th Air Control Squadron's deployment to Baghdad began with loading equipment - 90+ truck and equipment tows plus two radars - which was sent to Kuwait where the troops caught the equipment at the port and prepared to convoy into Iraq. They drove 500 miles thru Southern Iraq (2 x 14 hour days) to get to Baghdad International Airport (BIAP) - and set up the radar on an Iraqi air defense hill. Their mission is to provide the combatant commanders (Army , Air Force and Navy when in town) with a Recognizable Air Picture, provide control to fighters and tankers supporting ground troops, and forward all information via data links. They are responsible for the northern 2/3rds of Iraq and British radar unit controls the southern 1/3rd. ATC has stood up and begun the process of normalizing the airspace over Iraq so civilian traffic should start flowing real soon. Log Base Seitz is on the north side of the the Baghdad International Airport Compound. 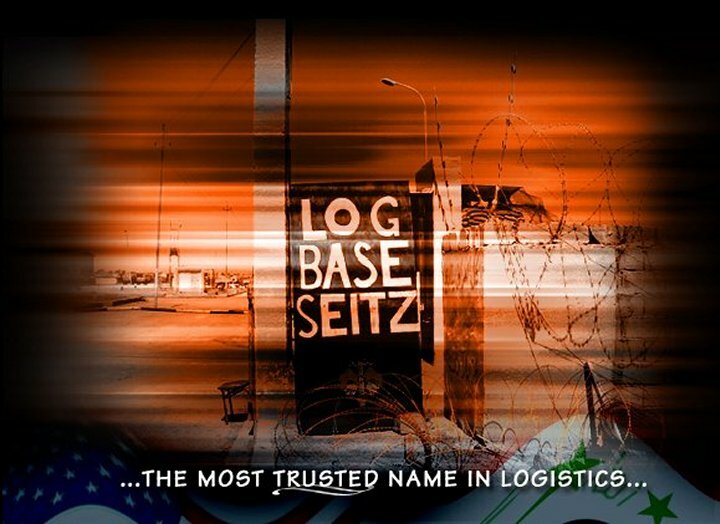 Log Base Seitz, the home away from home for 541st Maintenance Battalion of Fort Riley, Kansas. 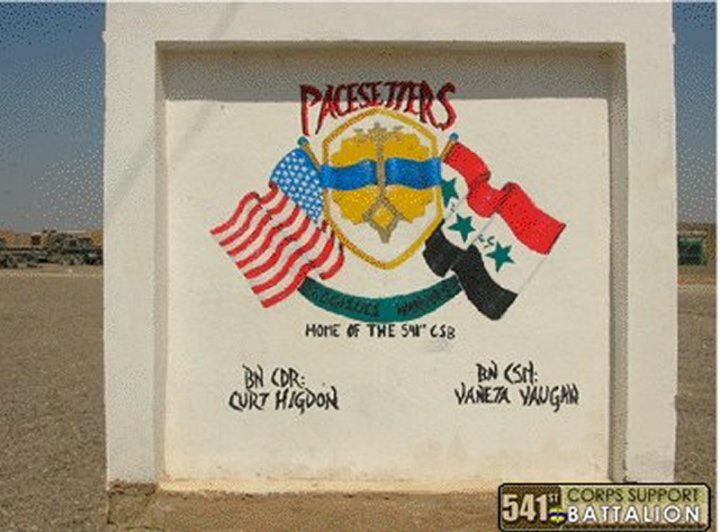 The Pacesetters and their subordinate units provide supplies, maintenance, fuel, water, showers, laundry, and transportation support to the thousands of soldiers in and around Baghdad, Iraq. 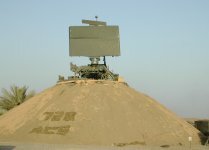 By November 2003 soldiers had finished safeguarding the living area against terrorist attacks and, ironically, hadn't had one since the day they filled the last bundle of sandbags. "Seitz Barber Shop" opened, and some of soldiers can continue a weekly tradition of getting a haircut on a Saturday morning. They found some great barbers from the 53rd Quartermaster Company that volunteer their personal time to cut the countless heads that desperately need trimming. "Dinar General," the shoppette, was almost done with the remodeling, and soon would have actual aisles to stroll down while looking for junk food and DVDs. The base MWR has four additional new computers up and running, and now there is no excuse to not email Mom, buy the family gifts, and remember to send flowers on our anniversary; all of which can be done conveniently at the MWR facility. The Chapel's been strategically moved right across from 24th Trans' barracks, along with the newly constructed 'Meditation Garden," complete with chirping birds. A primary benefactor of the Baghdad Burger King's delivery service is the 541st CSB at Log Base Seitz in Baghdad. The unit is situated outside the gates of the BIAP, so getting the 1,300+ soldiers an opportunity to drive over to Burger King and the PX is a logistical impossibility. The folks from Burger King have never failed to drive outside the gates and provide 400-500 meals to a bunch of great young Americans who are putting it on the line every day. The 1133rd was stationed at Log Base Seitz, Iraq. On one day, the mission involved 22 trucks and 47 personnel from the 1133rd and a new sister unit, the 1161st (from Ephrata, Wash.), headed to Kuwait for what was a six-day mission. No two days or two missions are ever. There was a lot to laugh about when comedians from the Comics on Duty World Tours, sponsored by the Armed Forces Entertainment, entertained Task Force 1st Armored Division Soldiers May 22-23, 2004. The tour made three stops around BIAP and one in Al-Kut to entertain TF 1AD Soldiers. On Friday, the show at TF 1AD's 4th Brigade hangars opened with the TF 1AD Rock Band. The band played such tunes as "Fat Lip" by Sum 41, and "My Girl" to a crowd of over 200 Iron Soldiers who came to let loose. On Saturday morning, the comics began their day at 2nd Brigade Combat Team's Stryker Island to entertain alongside the 1AD Dixieland Band. More than 300 Soldiers from 2nd BCT and the Division Artillery Brigade came to enjoy the show. 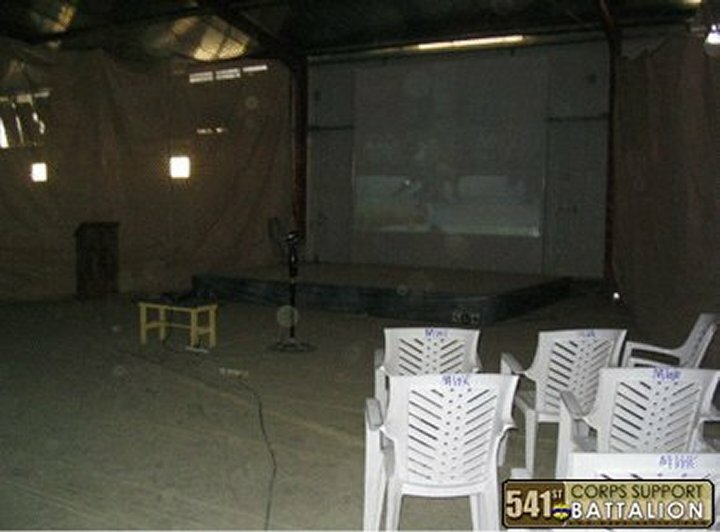 After the music, the five comics performed for 15 to 20 minutes each, leaving Soldiers in stitches. The comedians then moved onto 123rd Main Support Battalion where the "Mighty Main" Soldiers thanked the comedians with an overwhelming uproar of laughter and applause. 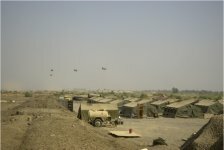 Camp Thunder was located in Western Baghdad and was a short bus ride from Abu-Gharyb. It is now closed.